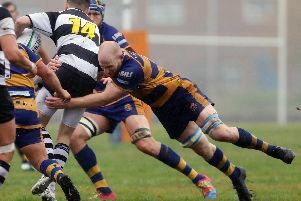 BALI SALISBURY praised his Portsmouth Valkyries squad after they lifted the RFU Junior Cup with a 22-8 win against Sutton Coldfield at Henley. The Valkyries head coach was thrilled to the team lift their first silverware. It was the biggest game the Rugby Camp club have been involved with in their 132-year history and it was the first time any Portsmouth senior side has won a national competition. Salisbury said: ‘All the coaching staff are immensely proud of the efforts the players have made this season. Team captains Charlie Morgan and Sandy Newsham lifted the trophy to the delight of the team and the travelling support. This first silverware for the Valkyries is testament to the hard work they have put in on and off the pitch this season. They continue to go from strength to strength with the ambition for a second senior team the Amazons and the creation of an under-13 girls team to help grow the future of women’s rugby in Hampshire. A brace of tries each for wing Bronwyn Jacobs and full-back Makeda Lewis gave The Valkyries the edge over Sutton Coldfield with Jordan Wilshire providing the extra two points from the tee. In the final stages the Valkyries stood up to everything Sutton threw at them. Big tackles from prop Pauline French and second row Sydnee Checkley kept the opposition at bay. Gutsy defence by Portsmouth was needed while the yellow cards were being served, wing Laura Ineson and her fellow backs put themselves on the line time and again, while forwards Wilshire, Kerrie McCormick and Lucia Crotti tackled with an intensity worthy of the occasion. Both teams gave their all and both sets of coaches used their subs to replace tired and weary bodies in the final exciting minutes of the game. There’s no rest and the Valkyries have a home game against London Welsh on Sunday at Rugby Camp. Welsh are favourites to top the table but there is still a chance of Portsmouth making it to the play-offs.